In April 2011 I wrote a blog post about the web 2.0 tools I use in my classroom (click here to read it)and have had some requests recently to update this and share what I and others are using to inspire their students and staff in their use of technology as a tool to help them learn (of course with the goal in mind first). I thought I would share a few ‘oldies but goodies’ and a few new and exciting ones I have discovered recently. This list is not exhaustive and there are many more but I thought I would highlight a small amount that will hopefully inspire you (and those around you) to go away and try something. In addition to this I would love to hear about the tools you use and most importantly how you use them as a tool in your classroom. In my new role as Head of ICT and Learning Innovation I am able to not only inspire students with their use of technology to help them learn but also inspire teachers and parents. I have a unique opportunity to make a difference and to me that is very exciting! Please have a look through this updated list of web 2.0 tools that I use or know about. Wikispaces – A Wikispace is a simple web page that can be used by schools, classrooms or student’s to share their learning. It is a free tool and easy to use. Check out the Wikispace I used with my class in 2012 and the Wiki’s we are using in 2013 for Year 5, Year 6 and Year 7 students. We have taken a more formal approach to their use this year and will be using the student’s individual pages as a trial e-portfolio – watch this space! YouTube – YouTube has quickly grown to be one of the most popular websites on the Internet. I personally use it for searching for education related videos and for uploading useful videos to our class wikispace. You can now privately upload your video’s so it is not publicly accessible. Skype – You can call people with Skype for free all over the world – amazing tool to use in the classroom – we use it regularly with classrooms around the world to ask questions when stuck or to help others with their questions – very powerful learning tool and now is made easier with the introduction of Skype for Education. Skype Education is something that I use on a daily basis with teachers across my school. 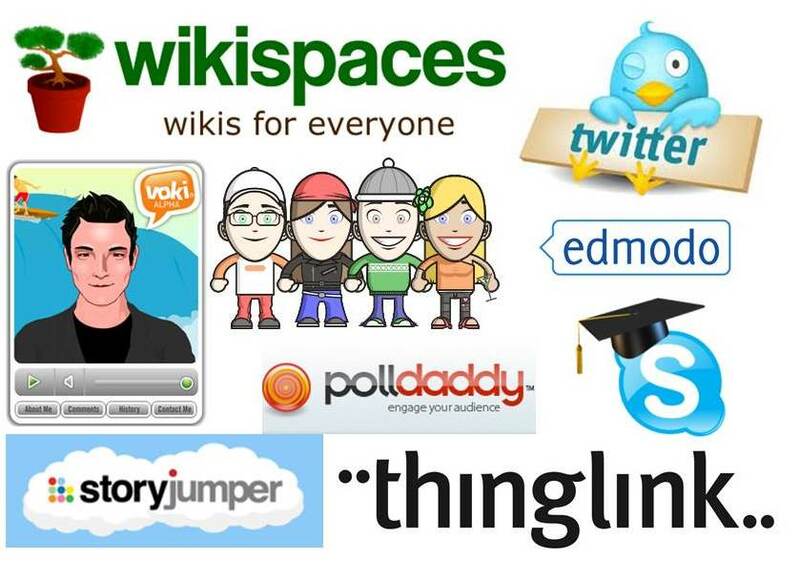 Voki – Still one of my favourite little tools to inspire students to share their learning or to add a fun twist to a lesson – It is a free embeddable avatar creator – great to use as a motivator for student’s – my student’s use them on their wiki a lot to share their learning. Audacity – A sound editor and recorder suitable for Podcasting. Free Download. I like this because we are on a Windows based platform at my school and don’t have access to Apple created software on a regular basis. Voicethread – Still one of my favourites in 2013 – always coming out with new updates and now have an app version in the app store – Voicethread let’s you create a collaborative presentation of comments by text or voice and allows you to draw. Here is an example of how I used Voicethread (a long time back now but still a good example – I have got many more). Prezi – Prezi lets you create zooming presentations. Create a map of your ideas, images, videos, then show an overview, zoom to details, amaze, convince, take the day. And it is very simple to use. My student’s use this independently as a fun creative presentation tool. I love utilising this as opposed to death by PowerPoint. XtraNormal – Xtra Normal is a Free Download. If you can type, you can make movies. Revolutionary real-time movie making software. Glogster – Glogster is a free service that lets you create interactive posters – My student’s enjoy using Glogster as an alternate way of presenting their learning. Wordle, Tagul, Tagxedo and TagCrowd – Create cool looking word clouds online for free – all of these sites are excellent and easy to use – the children love using these to share their learning – great for staff to use as well. I have just introduced this to the staff at school and there was a 50/50 split of staff who have seen and used and staff who had never heard of it – I think this is something that every teacher should know about and utilise! DropBox – online file storage for free – access anywhere in the world. This is great because now it is getting bigger and better as there is more competition in the market. I utilise this for file sharing between contacts on Twitter. Although I now also utilise Skydrive through my Microsoft account as well. Doppelme – Doppelme is a new discovery for me, shared through an amazing Twitter contact (@iTeachTweets). It is extremely simple and easy to create one, set up a free account and embed it onto any site. As a result of this I planned a lesson with my Year 5,6,7 classes last week to create an avatar that best represents you, add it to your Wiki page and use it to create your profile picture (this tied into our Cybersafety learning). It was amazing and the step by step process I provided allowed them to finish these tasks from start to finish in less than 25 minutes. Please check out the Wikispaces listed above to see their creations. I created my Avatar in the top right hand side of my blog using Doppelme. Photopeach – Again thanks to Twitter I had Photopeach suggested. Photopeach is a presentation tool that allows you to share, create and embed presentations anywhere at anytime. Pictures tell 1000 words and with Photopeach this is so true! Vimeo – Vimeo is always on the rise and is used a lot now by schools. It is a video upload site that allows you to share and discover learning through a interactive portal. There are public and private link options and a strong education community. Animoto – Another great Video creation and sharing site. Well worth a look and a play. Thinglink – This one is new for me and something that I have fallen in love with – you definitely need to check this out and have a play. You can create rich images with music, video, sound, text & more. Share and discover deeper stories through images. Edmodo – Edmodo is essentially a social networking site for students. A free and safe place for educators and students to connect and collaborate – This is new to me and something I am exploring and planning to introduce school wide in the next few months – I have set up a trial account and I am discussing use with other educators around the world via Twitter and Skype. StoryJumper – StoryJumper is a place to create and discover stories for kids. It is an amazing resource for both educators and now for students through the classroom edition. I have used this with groups of writers and we have published and purchased a hard copy book each. Amazing resource! OnlineConvert – The best free, online file conversion website I have found. Convert anything to anything. Great resource for educators with the ‘need for speed’. Evernote – Evernote lets your take notes, sync files across your devices, save webpages, capture inspiration, and share your ideas with friends and colleagues. Amazing educators all over the world are doing some incredible things with Evernote – it is well worth looking in to and asking others about. I hope you enjoyed reading this amazing list and I hope I have inspired you to go and try something new. Share this blog with a colleague and see if you can help inspire someone today. This is great, Craig! I will enjoy trying some of these tools. I have been watching your blog with anticipation over the past couple of days to see your new list. A really useful list- thank you! If there is anythnig you would like to know about or for me to blog about please ask – I am excited about it! A great blog Craig and one that I plan to come back to a few times. Thanks for a great PD session from the comfort of my couch! Thank you Penny – stay on my case – I need to be more attentive and add to this blog more frequently!